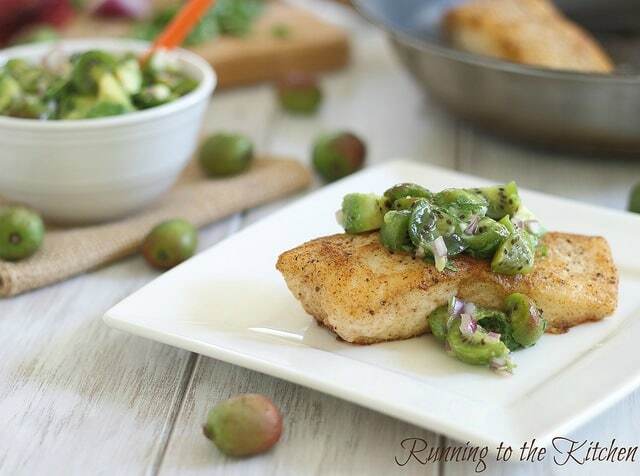 A simple pan fried halibut recipe with a sweet kiwi berry salsa topping. Kiwi berries….something I’d never even heard of let alone cooked with until last week when Ulysses brought them home from the store proclaiming he was trying to “broaden the culinary horizons of my blog readers”. Isn’t he so thoughtful? So this post is a family effort. I kind of felt like I was on Chopped or something being handed some obscure ingredient I’ve never seen and basically being forced to do something with it and share it with the “judges (that’d be you guys). First rule of Chopped…if you’ve never seen it before, taste it! How many competitors have you seen forget this?! As if those judges weren’t harsh enough, you best be tasting that damn unknown food just to show them you did! Otherwise, no matter how delicious of a plate you put in front of them, they’ll tear it apart just because they think you’re an idiot. And guess what? They taste exactly like a regular kiwi. Kind of anticlimactic actually. They do have one BIG thing going for them though vs. the normal kiwi. No fuzz. I hate the damn fuzz. In Italy, the only fresh fruit we were served for breakfast for 2 weeks straight were severely unripe kiwis that I’d try (mostly unsuccessfully) to butcher apart from their fuzz with a butter knife every morning. So the fuzz hatred is recent and strong. These no fuzz taste-a-likes were therefore immediately ahead of the game. Here’s where the reality show and life differ. Instead of racing towards some amazingly stocked pantry shelves, grabbing everything in sight just so the other contestants don’t take it first, I opened my fridge, saw the halibut I had intended to cook the night before but didn’t and this dish pretty much became a done deal. A slightly less dramatic and exciting process. If I could afford halibut in all it’s $19.99/lb glory every day, I think I’d be quite content eating it for the rest of my life. It’s like the steak of fish. I don’t know why they compare swordfish to steak all the time because that always tastes distinctly fishy to me. Halibut is not. It’s thick, buttery and practically screams to be lightly coated in flour and pan fried. Don’t fight the screams, just do it. Then top it with a non-fuzzy kiwi salsa. You won’t be on the chopping block. Season both filets with salt & pepper. Place flour in a small, shallow dish. Coat each fillet in flour on all sides, set aside. Bring a medium skillet to med-high heat with olive oil in it. 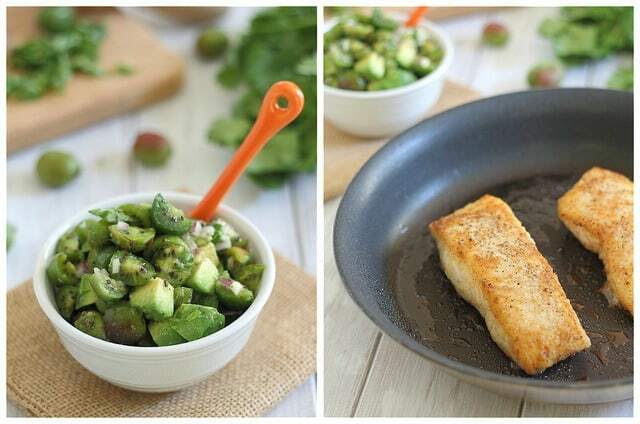 Once hot, place halibut in pan and "fry" on each side for 2-3 minutes until cooked through. Combine kiwis, avocado, red onion and cilantro in a small bowl. Whisk together lime juice, honey, salt & pepper in another small bowl and pour over salsa. Top cooked fish with salsa and serve immediately. If you can't find kiwi berries, substitute regular kiwis. They taste exactly the same. I love halibut, but your right it is so dam expensive!!! The kiwi berries are friggen adorable! I love Kiwi, but like you I hate the fuzz, these little guys are perfect! Love your dish today!! Kiwi salsa- really different but looks amazing!!! Chopped! I miss that show. I used to get major anxiety while watching it though…the pressure! But those kiwi berries…I can take those on any day. 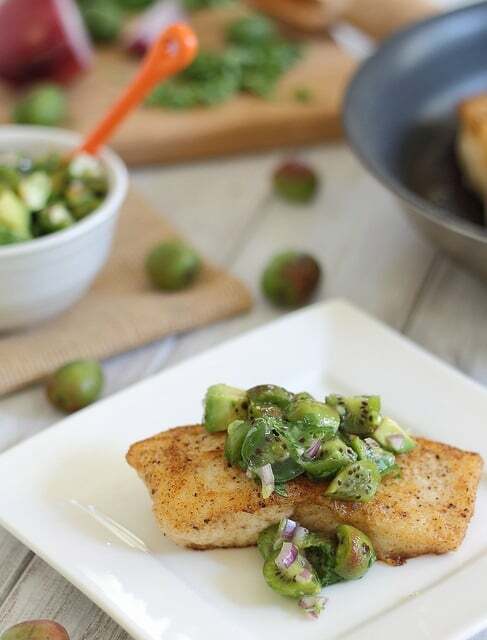 i agree about the swordfish-steak comparison…halibut is where it’s at! That looks yummy! I love Kiwi berries! I just ate some this afternoon. They’re so delicious, but no one seems to know about them and they’re hard to come by. kiwi berries – never had them but that must change as they look delicious!!! What a unique recipe. 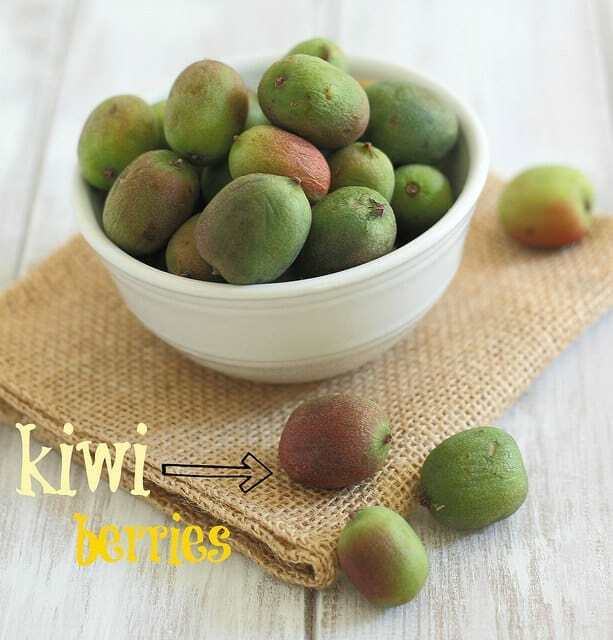 I don’t always love fruit with my savory meals but I love the idea of the kiwi. Such a beautiful pop of color too. mmm I love halibut! what a great new recipe! yummy! I’ve never heard of them! Learned something new. Silly question, you don’t have to peel them? That’d be epic! I’ve seen people eat the whole kiwi, fuzz and all…YUCK! Your man is so thoughtful to bring you gifts to cook up. I’ve never seen these before, but I love kiwi (and hate fuzz) too…definitely keeping my eyes open for them!